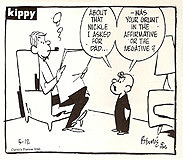 KIPPY was a different kind of comic strip - a social satire in which readers saw, through a child's wide eyes, the humor of many of the things adults take too seriously. 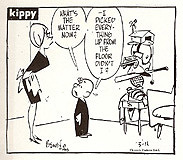 KIPPY's humor was deadpan, often devastating, always pointed. 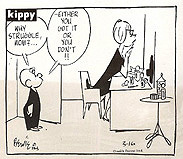 Created in 1961, written by Bernard Lansky and Jordan Lansky (Bernard's younger brother) and drawn by Bernard Lansky, KIPPY was designed to appeal to newspaper editors as well as their readers. 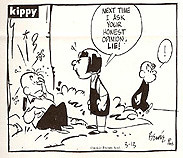 Although the strips followed a general continuity, each was a complete story in itself. 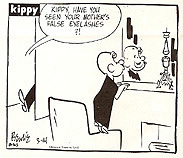 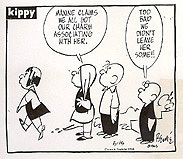 To view a larger version of a KIPPY cartoon, simply click on it.